One didn’t dare to inhale for fear of breathing it in. It was the sound of eighteen hundred airplanes approaching Hamburg from the south at an unimaginable height. We had already experienced two hundred or even more air raids, among them some very heavy ones, but this was something completely new. And yet there was an immediate recognition: this was what everyone had been waiting for, what had hung for months like a shadow over everything we did, making us weary. It was the end. Novelist Hans Erich Nossack was forty-two when the Allied bombardments of German cities began, and he watched the destruction of Hamburg—the city where he was born and where he would later die—from across its Elbe River. He heard the whistle of the bombs and the singing of shrapnel; he watched his neighbors flee; he wondered if his home—and his manuscripts—would survive the devastation. The End is his terse, remarkable memoir of the annihilation of the city, written only three months after the bombing. A searing firsthand account of one of the most notorious events of World War II, The End is also a meditation on war and hope, history and its devastation. And it is the rare book, as W. G. Sebald noted, that describes the Allied bombing campaign from the German perspective. In the first English-language edition of The End, Nossack’s text has been crisply translated by Joel Agee and is accompanied by the photographs of Erich Andres. 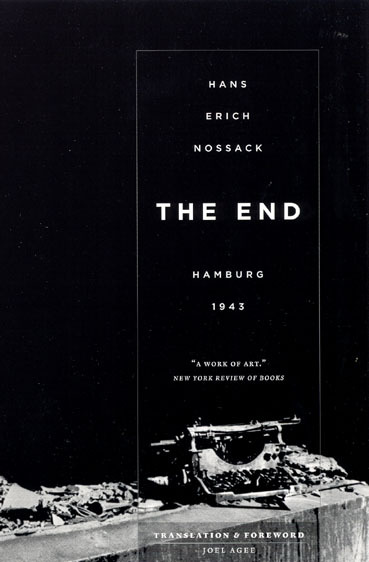 Poetic, evocative, and yet highly descriptive, The End will prove to be, as Sebald claimed, one of the most important German books on the firebombing of that country. "This is a brief book of extraordinary power. . . . Nossack succeeds . . . in conveying a remarkable sense of what it is that bombing on such a genocidal scale does to those who experience it. . . . A classic of its kind."